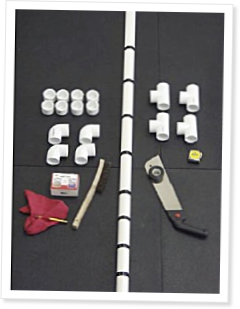 Coach Greg Glassman provides step-by-step instructions for making really cool homemade parallettes out of PVC pipe for around $20. Parallettes training is fun and highly developmental. Without gymnastics training we opt out of the most potent neurological training (coordination, accuracy, agility, and balance) available to an athlete. Parallettes training is essential to your gymnastics development. We hope our fervor for parallettes training specifically and gymnastics training generally will inspire all of you to get hold of a pair of parallettes and begin your gymnastics training in earnest. Several things inspire this project. The parallettes are dirt cheap. Anyone can make them. They come out not just good but fantastic. You couldn’t ask for better parallettes; we’re shocked at how nice they are. And it was a lot of fun building them. Exactly what to do -- and how to do it -- are fully described in the accompanying article and photos. Everything required is easily available wherever building supplies or landscaping materials are sold. Excellent article ... I will make a set this weekend! Made a set yesterday-super easy to do, watch out for glue fumes though. Used them last night just excellent-love the ab work on them. I made a set over the weekend. LOVE THEM! I practice my L-sits every night now! I made a set before i saw this article. They're so easy to make and fantastic for so many exercises, clients love them. I just wish Australian prices were more like U.S.A. Mine (although a little larger) cost over $100 for the parts. I made some in the UK. I had trouble finding 'equal T' joints. They were all slightly angled to aid the liquid flow through them, good for plumbing, bad for crssfit! I used high pressure pipe and fittings. A lttle more expensive but they are strong!!! When making the parallettes in the article, how heavy an athlete could safely use them? As Gino mentioned, any clue on how much weight these puppies could hold? I have fears of explaining how I cracked my skull open. I made a set today, I weight 195 and when I cut and test fitted everything there was a *lot* of flex though it held my weight doing a pushup with them so before I glued them I cut back the 24'' long top piece down to 18'' and they are far more solid and almost no flex at all. One thing I should have done was put alignment marks on the tubing and fittings before gluing as I ended up eyeballing it and they were slightly out of true which means they rock a bit just sitting there but as soon as you put weight on them they are fine. Once they've cured I'll try my full weight on them and if they break report that back here. I honestly think 24'' is too long thought with 1'' pvc piping and a heavier person using them, but don't hesitate to start with 24'' and dry fit them and see how the flex is, perhaps the type of pipe I was using is more flexible than other types. Just made them! It took around 15-20 minutes, SUPER EASY! I didnt use a hand saw but instead used a chop saw which made the cutes perfect. But i am sure hand saw would work just as fine. I agree with John, 24" seems a little too much. I have no problem with it because i am only 155 lbs, but 18" would put a lot strength in them. Also, again what John said, put marks in them to square it up! i eyeballed it and the PVC cement dried almost instantly, so there is very few seconds to ensure its straight or else it is rocky. But again, once wait is on there it is no problem at all! John is right on the money here; 24' is probably slightly too long. I've just made 'em, and get a smidgen more flex than I'd like as well, and I'm only 62kg. I also found that I wanted them slightly taller than specified in the article to ensure head clearance when doing handstand pushups. CFers who attempt this in future might want to consider making slight adjustments. Lastly, the end caps for the feet in the UK cost as much as the L corners, so better stability could've been achieved by subbing the end caps for L corners, and using two further lengths of pipe equal to the 'handle' length (24' in the example here) to connect both sets of feet. You'd lose the ability to overlap the parallettes and alter spacing, but very likely also lose the slight flex that I'm getting from my set. Thanks I will try this for sure.